Aside from being fun to read, we as writers need to study the publications we're trying to break into. I've gotten loads of cheap magazine subscriptions through various online discount sites, and even ebay. Here are some additional ways to obtain the magazines you're interested in, from freelancer Pam White. groups you belong to or know about - playgroups (parenting, home, cooking, family mags), business networking groups (entrepreneurs, home business, finances magazines), church (religious, devotional periodicals). 2 - Offer to take a friend to the doctor’s office. Okay, that sounds goofy but I love taking my children to the orthodontist, pediatrician, and dentist offices so I can scan the table of contents and skim the articles in the parenting, children’s, family, travel and money magazines. I bring a notepad and take plenty of notes. Find an article in an old magazine that would help your research? Ask the office to make a copy of it; offer to pay. 3 - Subscribe. Remember if you subscribe to a magazine that is for business purposes, you can deduct the cost of the subscriptions if you itemize your taxes. I am a food writer so I keep all receipts for food and writing magazines, and food and writing books to deduct as business expenses. 4 - Take up publishers on their free copy offers. It used to be that all magazines would let your send in a postcard and check the "bill me" square and you’d end up with two or three issues before they cut you off for not paying. These days, we cannot even be inadvertently dishonest. I get mailings from magazines offering me one free issue. I will send in the postcard and usually have a bill to pay before I’ve read the free issue. I then can decide to subscribe or put the bill in the postage paid envelope and decline to pay. 5 - Look for the online issues of particular magazines. It’s true that many use original content online (another good market to explore) but even the different content will show you what type of material the magazine is looking for. 6 - Read newspapers online. Do you want to write travel articles? Visit the major newspapers online. Most hire freelancers to cover a great deal of their special interest articles. Contact information for, in this example, the travel section editor will likely be available on the website. 7 - Write for guidelines. Look in The Writer’s Market. If you are looking for parenting magazines and find one that sounds about right to you but you’ve never seen, write for the writer’s guidelines and request a sample issue. Double check the listing of the magazine to see if there is a reduced price or you have to send a stamped envelope to receive a free copy. 8 - Go to the library. This is so obvious! 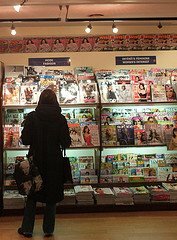 Make a bi-weekly appointment to go to the library and review the magazines you want to write for. Make notes. Use the library’s copier to photocopy the table of contents, or an article or two to review at home. research. While most require student identification to use the reference materials, you can read the periodicals unimpeded. (c) Pamela White, 2006 About the author: Pamela White published Food Writing, the free ezine for food writers from her website: www.food-writing.com She teaches food writing classes, and her book, Make Money as a Food Writer in Six Lessons, is available at Amazon.com. One I use all the time, and receive around 5 mags from for free, is http://www.tradepub.com/ -- check it out! It's a great resource. Spring 2008 Flash Fiction Winners Announced! Workshop Event: Now Get Published!